The morphology and evolution of landforms, together with the materials of which they are composed, play a major role in the development and distribution of the soils in the northern United Arab Emirates, where landforms of aeolian origin in the west contrast with fl uvial landforms in the east. These aeolian and fl uvial landforms in turn contrast with a belt of coastal landforms along the Arabian Gulf and the Gulf of Oman. 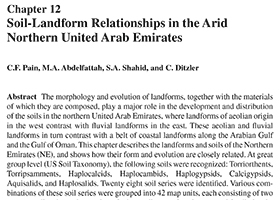 This chapter describes the landforms and soils of the Northern Emirates (NE), and shows how their form and evolution are closely related. At great group level (US Soil Taxonomy), the following soils were recognized: Torriorthents, Torripsamments, Haplocalcids, Haplocambids, Haplogypsids, Calcigypsids, Aquisalids, and Haplosalids. Twenty eight soil series were identifi ed. Various combinations of these soil series were grouped into 42 map units, each consisting of two or more soil series and a number of minor soil types. At subgroup and family levels, these soils can be related to specifi c landform morphologies and processes.